Here's the great news, our show teams have lead cards for you - simply check out our websites under "Confirmed Exhibitors" and all you need to do is print! Personal information -- Did you meet the family? Write down their names! Did they recently purchase their home? When? Are they going on vacation? Where? The more you KNOW, the better you will do. P.S. 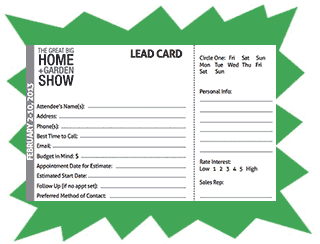 Do not put all home show leads in the same "pot" "bucket" "list" ...All home shows are not created equal, trust me. Tracking leads from each show separately will allow you to qualify each home show by the type of leads collected; as well as calculate the ROI from the business generated at each show.